Thank you all for the wonderful pieces that we received. We have 22 pieces in total and these have been judged. “It was very interesting to judge and the following are my views. 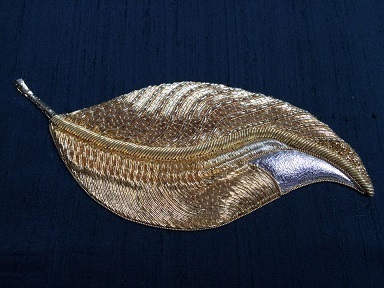 One looked for goldwork threads that contrasted well and complimented one another. The junction of the leaf and stem was often weak in many cases. It should be an extension of the leaf and not a ‘tail’. 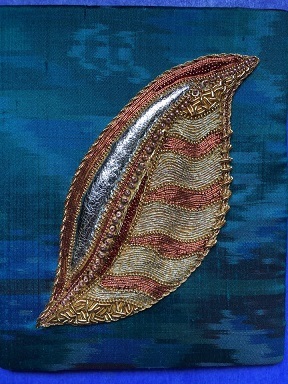 The edging of the leaf could have been a stronger statement……or nothing at all, the edge being part of the embroidery. The use of gold threads only, was a stronger statement. The best work followed the direction of veins and stem. Shapes, along with insects and animal features did not add to the whole design. It was just a simple leaf…..it did not require experimental extra’s. Colour rarely added anything to the final design. There was a temptation to turn a number of them into ‘an image of a sparrow’ when looking at them. There was a very interesting set of work from some people used to working in the same room as other goldworkers, but in many cases the work showed a lack of use of basic design. I have enjoyed studying this group of leaves and have learnt a lot myself, from how people approached the challenge. The cleverest person is one who uses different threads of gold thread and as many different methods of using it.”.